WARNING /Disclaimer: The procedures outline here are for educational purposes. Do not attempt. You are completely responsible for your own actions. Nitrocellulose, also known as cellulose nitrate, guncotton, collodion wool, Iodion cotton etc, is a highly flammable compound formed by nitrating cellulose ( (C6H10O5)n , eg. cotton) through exposure to a powerful nitrating agent like Nitric Acid. There are many uses of Nitrocellulose (NC). During world war 2, NC was used as a smokeless propellant, replacing gunpowder. NC is also used in films and plastics. For example, ping-pong balls are made out of NC. You might also be familiar with Magician's 'Flash Paper', sheets of nitrated paper (or cloth), which burn instantly, with a bright flash and leave no ash and produce no smoke. Other uses includes rocket propellants, lacquer coatings and waterproof fuses for use in pyrotechnics. Nitrocellulose can have different properties... this is determined by its Nitrogen content. It can be a resistant plastic, or a unstable highly flammable and explosive (when confined) material. Here the procedure for NC synthesis are outlined for educational purposes. It is a relatively safe nitration process, however, the product requires expert handling. Also, extremely dangerous chemicals have to be properly handled (Concentrated Sulphuric Acid and Nitric Acid), as well as other flammable substances (Acetone) make this hazardous for anyone not skilled in chemistry to even attempt. Attempting these procedures is highly discouraged and if you choose to do so, do it at your own risk. Reactions that will occur in this synthesis are the decomposition of Nitric Acid, and the nitration of cellulose. Two types of Nitrocellulose synthesis procedures are outlined here, NC trinitrate and NC hexanitrate. 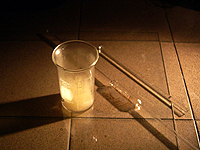 Sulphuric Acid, Nitric Acid, 250ml beaker, 200ml beaker, cotton wool, glass stirring rod, 10ml bulb pipette. A glass cover was used to protect the floor. The yellow light is from a table lamp. 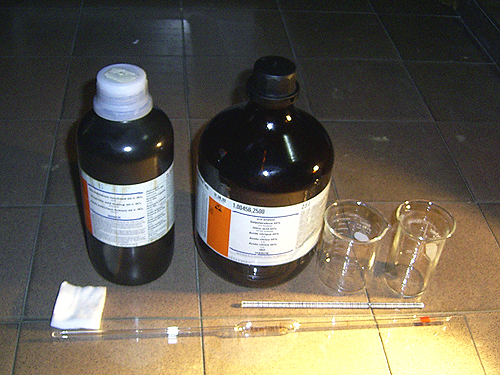 For trinitrate synthesis, a 50% 50% (by volume) of Nitric Acid and Sulphuric Acid was prepared. About 5ml of Sulphuric Acid and Nitric Acid (total) was mixed together. I am using Fuming Sulphuric Acid so the smoky stuff in the beaker is SO3 from the fuming sulphuric Acid. This dangerous fume when combined with water produces sulphuric acid and should be vented away. After that, a small cotton pad was added and stirred. The cotton was then allowed to nitrate for 5 minutes. at room temperature. The cotton was then fished out, and thoroughly washed in a saturated sodium bicarbonate solution and a few more times in water to neutralise the cotton. This was done until the leftover water tested neutral. Now two things can be done: 1, left to dry until fluffy again or 2, Dissolve in acetone. Lets look at the first method. After neutralizing the NC, it was left to dry in a warm place until all the water has evaporated until it becomes a fluffy cotton pad. What is left now is known as "Gun Cotton". This NC trinitrate is highly flammable and should not be stored in a confined space. You can also dissolve this cotton in acetone. 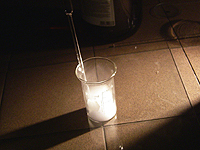 Only nitrated cotton dissolves in acetone. There might be a bit of un-nitrated cotton left and it should be removed. 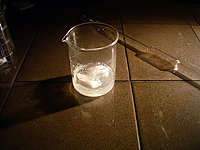 The acetone was then allowed to vaporize until a concentrated syrup-like NC lacquer is formed. It was then further left to dry. The result is a different form of NC trinitrate. On the left, a picture of the trinitate (cotton form) can be seen burning. 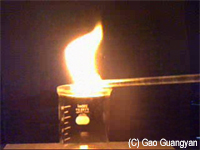 It burns all at once, with a very fast bright yellowish flame (due to carbon in the NC molecule). Notice how it leaves no residue and produces no smoke. Update: A better batch of Nitrocellulose has been made and more videos have been filmed. 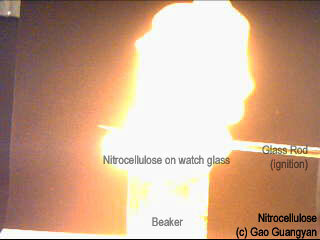 Above right is a frame capture from nitrocellulose deflagrating. Notice how it deflagrates with an extreme bright light at great speed, leaving no residue and producing no smoke. In case you were wondering, the nitrocellulose is ignited by flame: A glass rod has a cotton twine tied at the end. It is dipped in ethanol and lit. This is another 686kb WMV clip showcases 4 different amounts of Nitrocellulose being deflagrated, and one clip whereby a coil of Nitrocellulose is lit. Click here or the picture to download.